at Wat Buddhapadeep of Sf 310. Poplar Ave., San Bruno, CA 94066 and meditation center in Santa Cruz, 1260. Logan Creek DR Boulder Creek, CA. Fri. May 10th., 2019 : Meditation Program at Wat Buddhapadeep of Sf from 9.00 AM to 5.00 PM. Sat. May 11st., 2019 : Meditation Program at Meditation Center in Santa Cruz, 1260 Longan Creek DR, Boulder Creek, CA. from 11..00 AM to 9.00 PM. Transportation from Wat Buddhapadeep of Sf to Santa Cruz by the temple. Kindly come to Wat Buddhapadeep of Sf at 9.00 AM. Sun. May 12nd., 2019 : Meditation Program at Meditation Center in Santa Cruz from 8.30 AM to 5.00 PM, then returning to San Francisco. Remark : Meditation Program taught by Ven. Vimokkha both in Thai and English. Expenses : Meditation program is of no cost, but any donation is kindly accepted for food, transportation and other necessities. Ven. Vimokkha returns to Canberra from Thailand for a meditation on "Intuitive Awareness." This insight meditation will include talks and meditation sessions to demonstrate a pragmatic approach to arouse pure intuitive awareness with clear knowing and seeing. For more information, please contact patama30@gmail.com or telephone 040 993 7979. Ven. Vimokkha returns to the Metta Center from Thailand for a weekend urban retreat on "Intuitive Awareness." The workshop-style retreat will feature talks and meditation sessions to demonstrate a pragmatic approach to arouse pure intuitive awareness with clear knowing and seeing. Join Ven. Vimokkha for awareness and meditation instruction at UNIBODHI (University of Sydney Buddhist Society). Remark: to earn the most benefit to this program, participants must attend on all two full days. Lunches are provided including vegetarian. Participants go home and resume the next day. Ven. 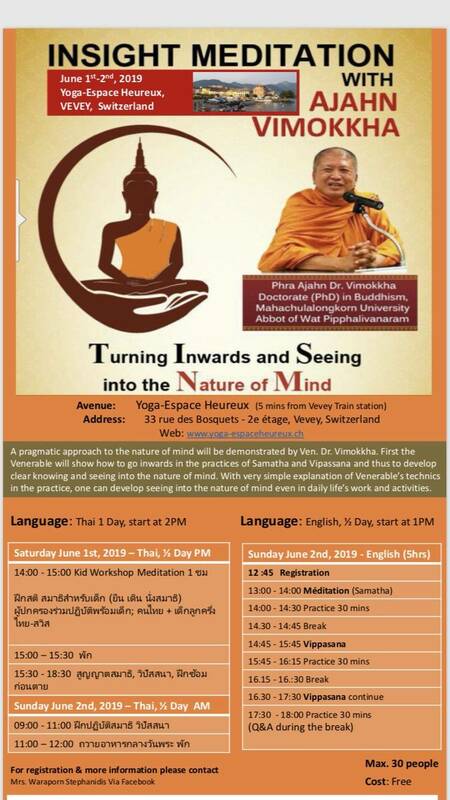 Vimokkha returns to the Metta Centre from Thailand again for three sessions over three days, exploring a “Pragmatic Approach to the Nature of Mind”. Ven. Vimokkha is the Abbot of Wat Pippaliwanaram, with a M.A. (Buddhist Studies) and Ph.D.(Buddhist Studies) from Mahachulalongkorn University (MCU). He has an extensive experience in teaching insight meditation internationally. Ven. 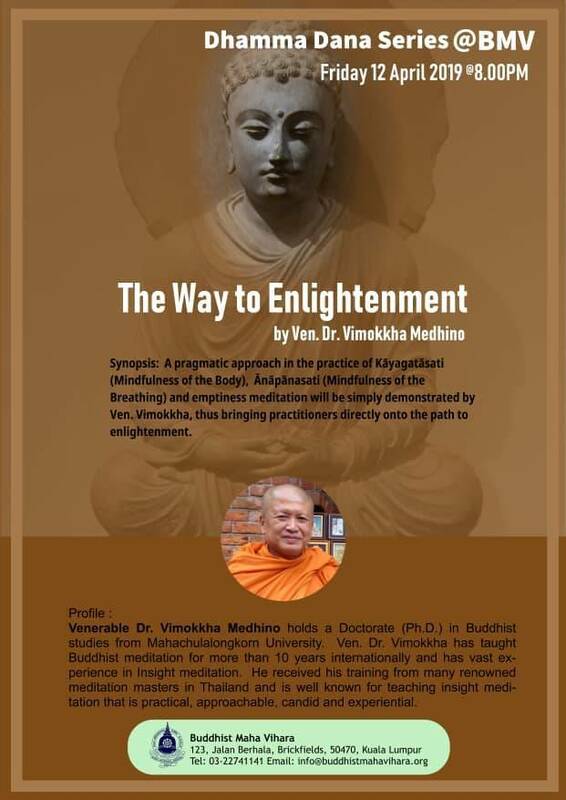 Vimokkha’s book, “The Development of Mindfulness for Insight Meditation” builds on his pragmatic approach to the development of mindfulness. How to go inwards in the practice of Samatha and Vipassana? How to develop a clear knowing mind through a pragmatic approach? What are the right techniques for this practice? How do we see the nature of mind in daily life activities? The royal funeral procession of His Majesty King Rama IX will be held October 25 through October 29, 2017. On the second day of the ceremonies, October 26th, the royal cremation will take place at Sanam Luang. In addition to showing our deep respect to His Majesty, this solemn occasion offers us the opportunity to remember Buddha's teachings on impermanence and suffering, and to strive toward spiritual progress. Ven. Vimokkha will offer a special 10 day retreat at Wat Pipphalivanaram in Rayong for all friends of the Dhamma. Participants may decide to spend the first day in Bangkok to pay respects to the King. Further details will be posted soon, but feel free to contact Ven. Vimokkha with inquiries. Ven. 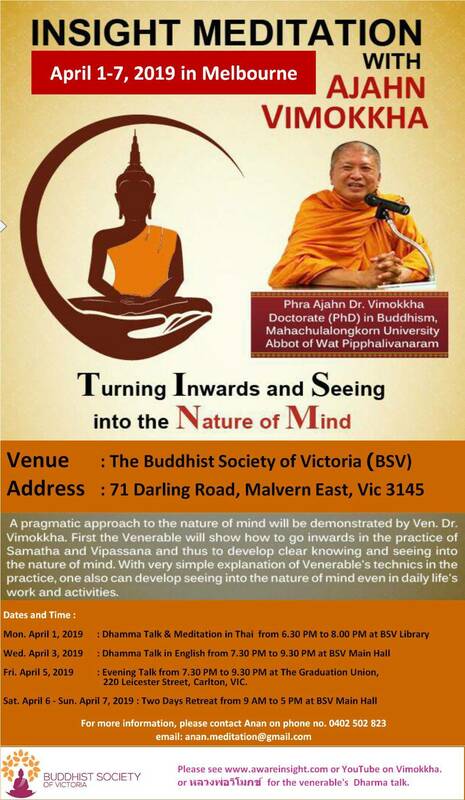 Vimokkha will present a pragmatic approach to experiencing the nature of mind. 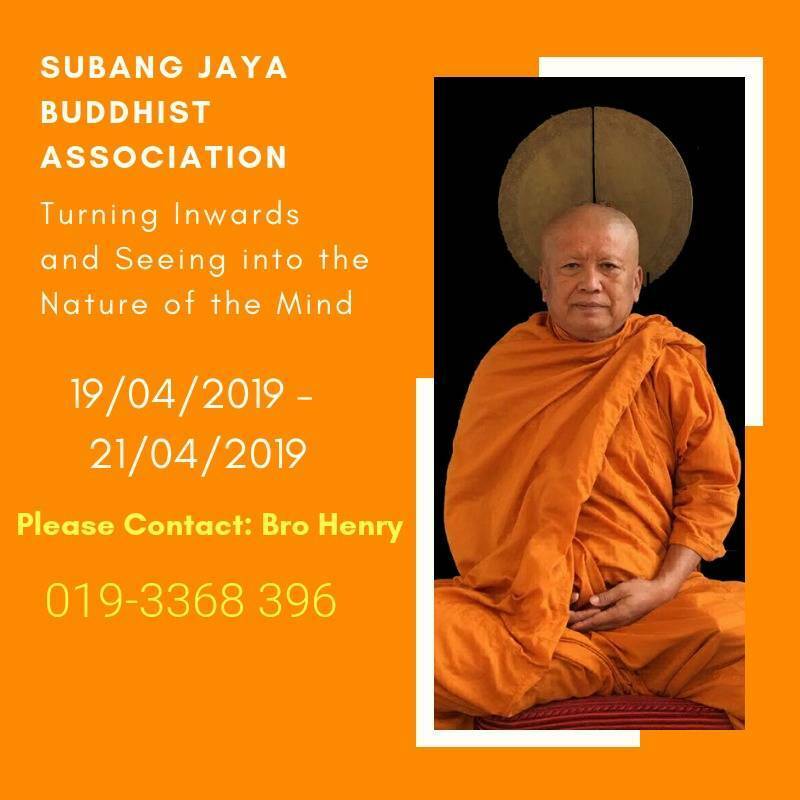 He will show participants how to go inwards using the ancient practices of Samatha and Vipassana and thereby develop clear knowing and seeing into the true nature of your mind. Join Ven. Vimokkha for meditation practice from 7 to 9 PM on June 18 and again on June 19th at Wat Ton Boon, 24 Bridge Street, Bradford on Avon, Wiltshire, BA15 1BY. For more information contact Saisunee 07834412961.